Every college basketball season, a team or two takes fans and media by surprise and outperforms its preseason expectations. This year, there are several, and not only are these teams ahead of schedule, many are ranked in the Top 25 polls. Let’s take a closer look at five men’s NCAA programs that have drastically improved their records this year, and some of the offensive sets these squads are using to see their success. Click on a diagram to add it to your FastDraw library or print/save as a PDF. In his third season as head coach, Bobby Hurley has taken the Sun Devils to as high as #4 in the national rankings with a 14-3 record to start the season. This includes a signature non-conference road win at Kansas. ASU runs a guard-focused offense utilizing the skills of seniors Tra Holder and Kodi Justice, as well as junior Shannon Evans. The Sun Devils ran this play to clear the floor and give Justice (3) a chance to drive to the basket. After 3 gets the pass from 1, 1 cuts in front of 3 and to the left side of the floor. 3 then drives to the right taking his defender one on one to the basket. 2 stays spread out on the perimeter to keep x2 from providing help. Coach Chris Beard has done a tremendous job during his short time in Lubbock leading the Red Raiders to an 18-14 record and a NCAA Tournament bid in his first season. This year, the Red Raiders have continued their strong play and are looking to advance deeper into the postseason. 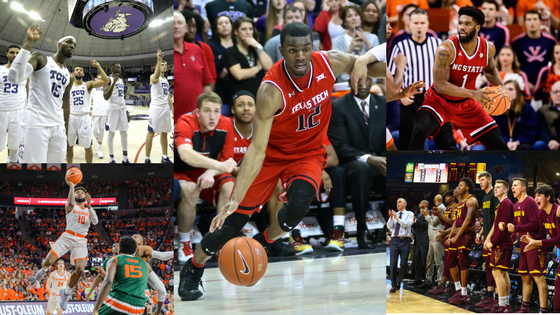 TTU currently boasts a 15-2 record and a #8 ranking with two wins over top ten opponents. The Red Raiders run a motion offense on most possessions looking to create using movement and screening actions. However, they will run set plays after timeouts and when they are looking to create for a specific player. 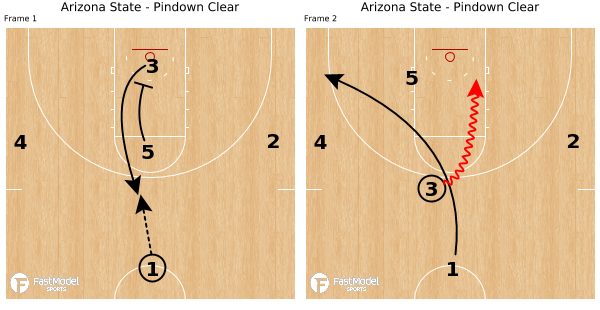 In this box set, Texas Tech gets the ball to one of its guards cutting off of screens to receive the ball on the wing. There he will look to create out of a side pick and roll with the rest of the team spread out on the perimeter. The Big 12 is one of the top conferences in the country right now with four teams in the top ten. Led by Coach Jamie Dixon, Texas Christian is the fifth ranked team in the conference, and has has reached #24 in the national rankings with a 13-4 start to the season. 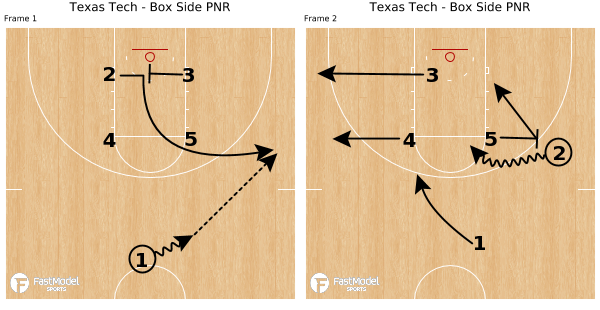 In this early offense play, the Horned Frogs work to get 3 open for shot after running his defender through multiple screens. 1 starts the play with a pass to 3 on the wing. As the ball is swung to the other side of the floor, 3 cuts off of a back screen from 5 – a decoy action for misdirection. Once the ball is on the right side of the floor, 3 turns around to cut back off of a stagger screen from 5 and 4. If 3 isn’t open, 1 cuts to the top to get the ball reversal. 3 can then run the baseline off a screen from 5 to get a shot on the other side of the floor. The Clemson Tigers finished the 2016-17 season near the bottom of the ACC going 6-12 in league play with a 17-16 overall record. But with a veteran starting lineup that includes two seniors and three juniors, the Tigers have turned things around this season and currently sit in second place in the conference. Coach Brad Brownell’s squad has nearly matched last years win total with a 15-2 record to start the season. 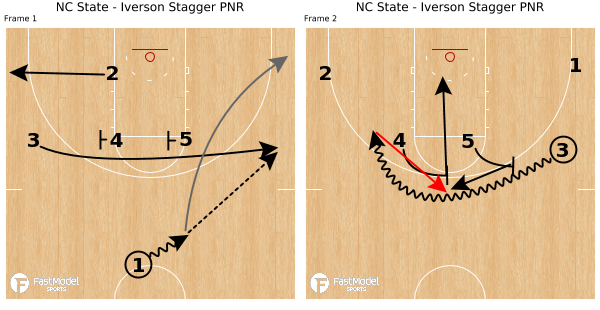 In this play, the Tigers use ball and player movement to isolate a side of the floor for a pindown screen for one of their perimeter players. 1 passes to 4 on the wing then cuts to the ball side corner. 2 then V-cuts to receive the pass up top from 4. 5 then sets a pindown screen for 3. Because the Tigers have isolated the left side of the floor, 3 and 5 are playing 2-on-2 off the screen without any other help defenders in the area. When 3 receives the pass and sees x5 providing help, he quickly passes to 5 for the finish at the rim. In his first season in Raleigh, Head Coach Kevin Keatts has led the Wolfpack to a 12-6 start including three top-25 wins. They have a balanced scoring attack in their ball screen heavy offense led by guard Allerik Freeman and center Omer Yurtseven, who is currently shooting 64% from 3-point range. The Wolfpack used this after timeout play to allow Freeman (3) to create off the dribble and Yurtseven (5) to stretch the floor from the 3 point line. They started the play with 3 making an Iverson cut off of 4 and 5 to receive the pass from 1 on the wing. 1 cut to the corner to provide spacing as 3 dribbled off of the stagger ball screen from 5 and 4. As 3 turned the corner on the second ball screen, x4 had to provide help. 4 then rolled to the rim forcing x5 to provide help on him. This allowed 5 to get an open look at a three point shot off of the pass from 3. It will be interesting to keep an eye on these teams the second half of the season. Will they continue their hot start as they get deeper into conference play? Will this momentum take them on an NCAA tournament run? If they keep executing sets like these, chances are they will.